My pork-loving heart was lucky enough to come by some authentic Ilocos Bagnet, brought back by a generous friend who had come back from a whirlwind trip to the region. 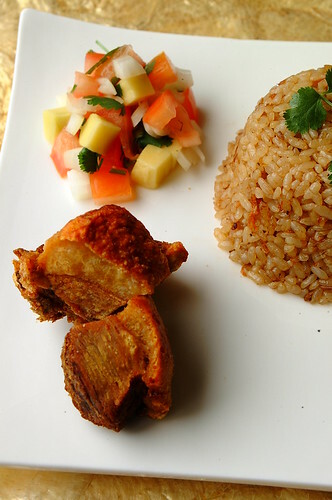 Bagnet is a deep fried pork dish from the Ilocos Norte region of the Philippines. It is sometimes called Ilocano Chicharon…a sure sign that I’d love it (as I love chicharon). Unlike chicharon though, bagnet is made with one whole big hunk of pork belly. I’m no expert, and I’m sure there is more than one way to prepare it, but based on what I’ve been able to gather, the piece is boiled in its entirety for about an hour with certain herbs and spices, then dried in a hot oven, then deep-fried in low heat for another hour. After this you can either cut it up into smaller chunks, or leave it whole, then deep-fry again, this time at high heat, until golden brown and crisp. Whoa. Yeah. Thank goodness they have commercialized bagnet to a certain extent so that girls like me don’t have to go through watching something deep-fry for an hour (never mind the boiling and the baking). You can now purchase a hunk of bagnet, from good and authentic purveyors, after it’s first long deep-fry. You can then keep in the fridge for a couple of weeks, or in the freezer for longer. Anytime you need a fix, you simply hack off part of it and do the last, quick and hot deep-fry until it becomes golden brown and super crispy. I like to think of it as “fresh” chicharon. Now, with that hunk of pork goodness in my hands, what was I to do with it? I have had bagnet before, with loads of bagoong balayan (fermented fish paste). I already loved it back then, and would eat it until my lips were itching from the bagoong balayan (I have no allergies, but bagoong balayan packs such a strong wallop, that even non-allergic people sometimes get itchy lips). I wanted to try something different now. I had just made a big batch of binagoongan baboy (a Filipino dish of pork stewed in shrimp paste) so I decided to set aside some of the sauce for the bagnet. I now had a thick tasty sauce of bagoong stewed for hours with a ton of tomatoes, onions, garlic, and the juices of the pork. After I saw this post though, I realized that the sauce would only make the bagnet soggy…and if there is one thing you want bagnet to be, it’s crispy, not soggy. Hmmm…think Jo…aha…fried rice! There are very few food challenges that can’t be solved by fried rice, and that’s what I decided to do here. By making bagoong fried rice, I could have my bagnet in all its pure crispy glory, while having my bagoong “on the side” in the rice. I used my leftover binagoongan sauce to make fried rice by first sautéing some garlic, then adding the sauce, and then the rice. This is an excellent way to use up extra binaggongan baboy sauce if ever you have any. I then prepared a side salad of chopped tomatoes, onions, burong mangga (fermented or brined unripe mangoes), and cilantro. Preparing the bagnet was just a matter of cutting it up and deep-frying until golden. The cool, fresh, sour crunch of the salad, with the cilantro’s bite, was a perfect compliment for the fatty pork. And the bagoong rice was a great new way to have the baggong with the bagnet. What a meal! I was ready to pass out with the pleasure of it! I dunked the bagnet in my spicy vinegar mix, and really, when my teeth went through the crisp skin and glorious fat I nearly forgot my own name! I swear it!